Stick Shifts Make Up Less Than 4% of New Car Purchases, Can You #SaveTheManual? Discussion in 'Cars in General' started by GTPNewsWire, Dec 6, 2018. This article was published by Joe Donaldson (@Joey D) on December 6th, 2018 in the Car Culture category. Unfortunately a lot of the people that say manuals are cool will not buy manuals, they are cool but auto is just taking over and it has too many benefits. No one is stuck in traffic in Stoke on a cold night thinking their experience would be better with a manual. With the exception of my SUV I purchased a few months ago, all my cars I’ve purchased over the last thirty years have been manual, still like working through the gears, though being stuck in rush hour traffic in stop n go, not so fun. Well, the problem is manufacturers are not giving the option. And current cars available in manual (personally) either don't appeal my taste, or are way too expensive. I wish my Impala had a manual transmission. As wierd as that would be, it would be awesome. Skyline_R34 and SecretAgentZero like this. I’ve always had manual cars and prefer them over auto in most cases, but sadly there aren’t many new car options that offer it anymore. Even still, after commuting with a manual car for many years in a densely populated area with traffic jams regularly, I wouldn’t rule out an auto in my future. Don't bother trying to buy a brand new manual to save them. They're so done, they're now done twice over (automatic and electric cars). If you love manuals, go find a classic and hold on to it. Beeblebrox237 and Joey D like this. I agree that manufacturers are to blame for not giving the option of a manual. Really like a manual so if they stop making them i will have to buy a used car with a manual. You mean customers. Manufacturers would make it if customers wanted it. McLaren, Suzumiya, GT Kelv and 3 others like this. Aside from a few special cases where codevelopment of auto and manual options is prohibitively expensive or, for packaging reasons, one or the other doesn't fit, manufacturers will make both if they can sell both. They only make what they can sell, because they lose money if they can't sell what they make. It's hard to justify the development costs of something that only 20% of customers buy, so they'll stop developing it. If people don't buy something, car manufacturers won't make it. SiriusR and Joey D like this. No i mean manufacturers as they are making more and more models without a manual option. I appreciate they may go hand in hand with what customers have been buying but Audi for example stopped production of a manual S3 a few years back. At least Porsche have seen that enthusiasts like a manual and they are now producing models like the 911R and the GT3 with a manual. It's not because Porsche loves manuals and wants to keep them around. They started to phase them out and realized that demand was high for a manual option. You mean customers. eiriksmil, jbs0311, GT Kelv and 1 other person like this. The last part worries me as everyone has gone s.u.v crazy and i can't stand the things. I like a 3 door hatchback and even that is becoming more and more rare these days. As for development costs, manuals are a lot cheaper than dsg's. The last part worries me as everyone has gone s.u.v crazy and i can't stand the things. Yes and no. It's all about scale - both physical and the amount you're making. VW can churn out seven-speed DSGs until the cows come home, but they don't have many seven-speed manuals - so it'll be more expensive to make the manual, if one will even fit (and they can get a physical gear linkage in through the shell). Why do they need seven speeds? Emissions, of course! I'm ok with manuals going away. 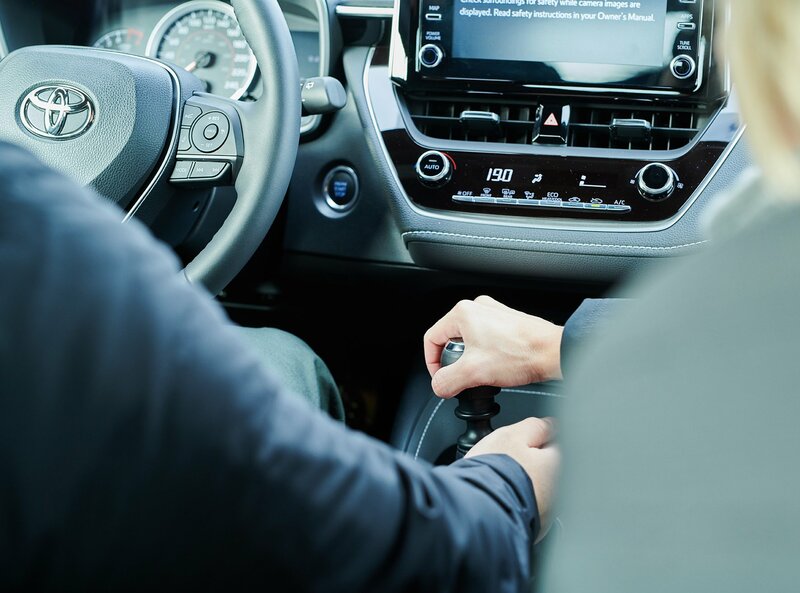 Honestly, cars are getting equipped with so many additional features that soon, it'll feel like everybody will be too busy doing everything else but actually driving the car soon; is that why there's a push for self-driving cars, too? I feel as if a manual transmission makes you a better and safer driver because it actually directs your attention to the driving. Not only that, but a manual transmission makes driving enjoyable and fun, too; that Honda Accord may look boring from the exterior, but when you climb inside and there's a stick shift, suddenly it's a pleasure to drive! With so many dangerous drivers in my area, manual transmission cars could make for much safer and cleaner roads around here. Not to say that people shouldn't have their preference, but there's a lot of drivers who step foot in a car, just press a gas pedal, and go, and their other dangerous driving habits usually involve not paying attention to their driving at all, on their phones, fiddling with their touch-screen carputers, drinking, smoking, whatever it may be. Almost none of my friends and/or contacts would ever think about driving a manual stick-shift car, meanwhile a stick-shift was how I learned to drive in the first place. My thoughts could be biased, but this is based on what I've been seeing in my area in terms of trends for the last few years now. Most of super die hard manual fans that bash on autos can't even afford a sports car for one and usually some yaris driver or something along those lines which is auto. I'm doing my part the question is can the fans do theirs or are they gonna have some pseudo passion for cars? Dealers are the true customers of the manufacturers in North America, not the consumer. They’ll only stock on the lot what will sell quickly, and manuals don’t sell. If dealers had their way vehicles would only come in white, black, silver, and two shades of gray. Someone should publish a percentage of manual vehicles that are special ordered rather than purchased straight off the dealer lot. Probably more than 80%. The problem with the #savethemanuals movement is that everyone is so picky (HuskyGT’s comment is a good example). The Chevy SS is a prime example here. It’s pretty much the enthusiast dream car, available with a manual, and no one bought it (until they announced its cancellation). Also 99% of those people never buy new. Dealers are the true customers of the manufacturers in North America, not the consumer. They’ll only stock on the lot what will sell quickly, and manuals don’t sell. So... you mean the customer is the customer then... right? Because dealers are just buying cars that will sell... to customers. The problem with the #savethemanuals movement is that everyone is so picky. The Chevy SS is a prime example here. It’s pretty much the enthusiast dream car, available with a manual, and no one bought it (until they announced its cancellation). Also 99% of those people never buy new. I'm an enthusiast, I've driven an SS, I didn't want one. For one thing, it looks like a malibu, a car that didn't look good in the first place. samdu and kikie like this. The manual transmission, aka the best theft prevention device in the US. Side note: Is anyone else confused about the context of that stock photo? Just me? Robin and I-Runner like this. I feel as if a manual transmission makes you a better and safer driver because it actually directs your attention to the driving. Assuming you've driven a manual-equipped car I'm not sure how you came to that conclusion. When I drive one, I don't need to pay any extra attention and I don't even drive a manual that often. When I'd race, it was a bit more involved though since gears mattered as did the shift points. On the road, it's just go up through the gears until you hit sixth, then just cruise along. Not only that, but a manual transmission makes driving enjoyable and fun, too; that Honda Accord may look boring from the exterior, but when you climb inside and there's a stick shift, suddenly it's a pleasure to drive! I disagree with this. A boring car will be a boring car regardless of what transmission is in it. A manual isn't going to make an Accord anything more than a family sedan with a manual, it's not suddenly going to be a driver's car. I didn't mind the SS, I drove one when shopping for my Volvo. It just felt heavy and unrefined though, but it's Australian and all the cars we got in the US courtesy of Holden were like that. Still, GM could've made it so much better with little effort and if they'd actually marketed the thing it probably would've sold better. Me and my step-son were having this conversation. We both drive manuals at the moment. We're both thinking of getting autos as next cars. Not do to any kind of traffic, mainly just to cruise. I see a few nice Last model Cressidas. I wouldn't mind hoping in and experiencing that straight-six driving from Newcastle to Sydney and back. Anyway, I've also got my eye looking to the future of EV. So, I'm not too fussed about manuals dying out as I once was. Hey, most new race cars use finger tip controls. So, I could get a car that's pretty much what racers use on the track. I also noticed it,i don't know if my mind is dirty or if it is intentional. A manual transmission can make driving more enjoyable to drive and fun. That is not necessarily the case, and some cars are pretty loathsome with either option if both are offered. I certainly know of cars where the manual existed so poor people could afford to buy that model, and easily ruined a car that was not too bad to drive. Even going back to the 90s, there were 4 speed automatics that were responsive and mated well with their engines to the point where I'm not sure a 5 speed stick would have been an improvement. To be honest I always thought this was the case in the US - I'm surprised that manuals make even 4% of sales there. Manuals are, however, alive and well in most of the rest of the world, and especially in places where you need to be able to drive a manual in order to not be limited to car choice. For example in the UK you can pass your test in an automatic, but you'll not be allowed to drive a manual. Pass your test in a manual and then you'll be able to drive both. I learnt to drive manual and I hate automatics - I don't feel in control with them - not being able to quickly and instinctively disengage the drive train via the clutch, or use the clutch to balance the car. Wolfe, Dave A and Sick Cylinder like this. It's hard to take Facebook selfies and shift gear. CLowndes888 and BionicDerp like this. The percentage of people buying automatics has always been much higher in the USA than the UK, but as @Slapped says in the UK to get a full license people must first pass in a manual. The people who take a test in an Auto in the UK are normally people who have failed the test on a manual on multiple occasions - i.e. they are normally terrible drivers! Of course there are also people who are physically disabled who just pass the Automatic Test. No normal young person in the UK would even dream of restricting their future car choice by taking the Auto test even if it means taking a few extra lessons to get proficient on a manual. Like @Slapped I also hate Autos - my Wife had to get one because of an injury to her left leg, but I hate the Auto and never feel in full control of the car - manual I find part of the pleasure of driving - auto takes away that pleasure and feeling of control. I love a manual and will choose a manual over an automatic any time but if automatics is the future, I will adapt and start to love them as well. I wonder if one could do a cross-correlation between the cars that are selling right now and cars that might actually be fun with a stick. Because the average van, SUV, crossover thing that you see driving everywhere is not going to be any more fun with a stick. So why would someone row gears in traffic when their car is no fun to drive anyway? The cars that people are buying today (in the US) aren't improved with a manual. I happen to own a car in automatic form that most of you would say should be a stick - a 4-door E46 330i. And I love that car and it is great fun to drive in automatic form. It's an easy, fun, practical car, that looks great, feels great, and doesn't get in my way. I would not change that car for a stick. It being an automatic is part of what makes it great. My MR2, otoh, would be absolutely ruined with an auto. Isn't it possible to make an H-pattern manual gearbox with a clutch which can be an automatic as well? Sim Racing hardware has it? I mean an H-pattern manual with a fly by wire clutch pedal which can be operated by a motor (robot or whatever you call it) mounted on the gearbox when you choose automatic mode. My Fiat 500 has a standard 5-speed manual gearbox (no clutch pedal) and the clutch is operated by a small robot mounted somewhere nearby or on the gearbox. Well, the problem is manufacturers are not giving the option. Nope — like @Danoff said, the "problem" is customers. Customers vote with their wallet, so if there's little demand for manuals, companies simply won't make them. No i mean manufacturers as they are making more and more models without a manual option. Let's say I run a restaurant, Slip's Sandwiches. When I open, my sales are split down the middle between roast beef and BLT. I make sure my inventory is evenly distributed between the two. Over the years, sales figures stay the same, but people just don't order roast beef. I sell nine BLTs for every single roast beef sandwich. If I'm still ordering as much roast beef as I am BLT ingredients, I'm not only going to sell out of the latter, but the former is going to go to waste. You could argue that maybe running lean on the BLT sandwich will force customers to order the roast beef. It might — but that's not customer satisfaction. And it's highly unlikely the conversion rate is 100%. So as someone who learned to drive stick later in life, I see what you mean, with one caveat: it's likely to make someone a more attentive driver after they've learned. But before that, they'll likely be worse than the average auto driver, IMO. Driving manual teaches you to anticipate the movement of traffic around you. That's great. But for the same reason true multi-tasking is a myth, in a high-traffic situation, I'd trust a new-manual driver less than if they were comfortably in an auto. In addition to the cars on the road, there's pedestrians and cyclists everywhere vying for this person's attention. I just got done doing a week-long experience with a manual car for an upcoming review. It was a perfectly good companion, but I can tell you that leaving Toronto, during rush hour, on a wet, slightly snowy night, and having to avoid the highways in favor of massively hilly surface roads, was not my idea of "fun". Cars leaving about six inches of space off my back bumper did not help, either. I was confused too! It was what Toyota provided for the #SaveTheManual event I went to, so it made sense within that context. I hate to bring up the much-used Rolls-Royce example, but... Rolls-Royce. Can you imagine hopping into one of the new ones and having to row your own? How... undignified. SiriusR and Danoff like this.